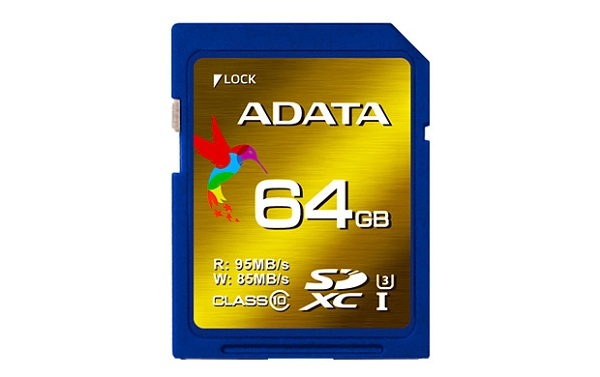 ADATA Technology has announced the launch of XPG and Premier Pro series SDXC UHS-I Speed Class 3 (U3) memory cards. Compared to the UHS-I U1, write speeds are increased by 750% and 500%, respectively. Both series are designed to support latest UHS-I U3 specification, enabling the cards to capture professional grade high-quality images as well as smoothly transferring large files without any time gaps. As demand for ultra-fine quality video continues to increase, the 1920 × 1080 pixel resolution of Full HD in the past has quickly evolved into the 4K Ultra HD high resolution standard (3840 × 2160). High-quality video recording creates larger files which require more disk space, presenting challenges to the operation and load bearing capacity of recording equipment and storage media. The XPG and the Premier Pro SDXC UHS-I U3 are specifically tailored to 4K2K ultra-high definition devices, and deliver outstanding speeds of up to 95/85MBps and 95/60MBps, respectively. The SDXC UHS-I U3 cards are ideal for burst mode photography and high resolution videos to capture each fantastic moment with the utmost precision. According to SD Association, the UHS-I Speed Class 3 (U3) must achieve a minimum write speed of 30MB per second and support UHS-I U3 photographic equipment specifications to deliver optimal capacity. The XPG and the Premier Pro series SDXC memory cards are based on UHS-I U3 standard and provide our users next level of performance. ADATA SDXC UHS-I U3 cards passed several tests under extreme conditions and offer a lifetime warranty. The XPG series provides 64GB of storage capacity and the Premier Pro series is available in both 64GB and 128GB.